Our third day on the trail began with another dose of tent-side tea and hot water to clean up with. We were at a lower altitude than we were the previous night, which meant warmer sleeping conditions. It had also rained during the night (our only rain during the whole trip), which made snuggling in the sleeping bag extra cozy. For breakfast we enjoyed some lovely eggs and tasty homemade hot chocolate, and then we hit the road. Day three only demanded a few hours of hiking, most of it a drastic decent on steep stairs. We arrived at our destination around 1:00pm. 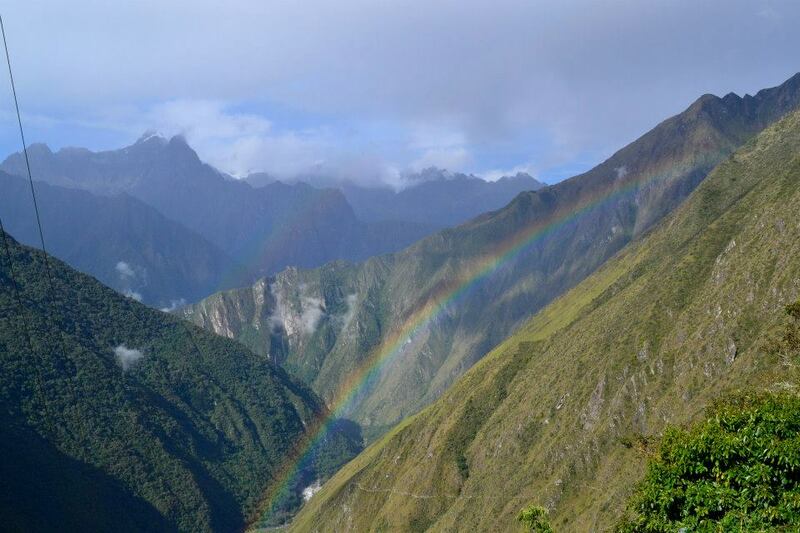 After eating and some downtime in our tents, we headed to a nearby ruin called Wiñay Wayna, but not before being treated to a double rainbow over the jungle – an added beauty that struck us as borderline absurd amid the already spectacular surroundings. Wiñay Wayna was amazingly preserved and a spectacular site to see – and explore. It was another testament to the genius of the Incas. The nineteen fountains they had built into the structure were engineered to transport water from a nearby source and carry it from one fountain to the next, so that water was accessible throughout. During our visit the water was still flowing, hundreds of years after the structures were in use. After exploring the site and doing our best to take it all in, we returned to the camp for 5:00pm tea and popcorn. Following that we had our last lovely sponge bath – nothing like bathing from a bowl – and reassembled for our last dinner as a group. By 8:30pm, the camp was quiet. 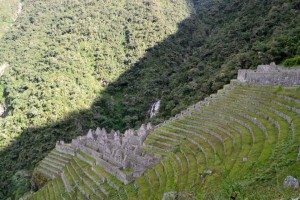 The following morning we would be rising at 3:45am to hike the final stretch to Machu Picchu.